Tonight’s dinner was a work in progress during the day. It was one of those meals that you find a bit of time for, leave, and then come back to. Slow roasting the tomatoes for the tart took a while, and they really benefitted from being left in a hot oven (that I turned off) when we went out for the day. 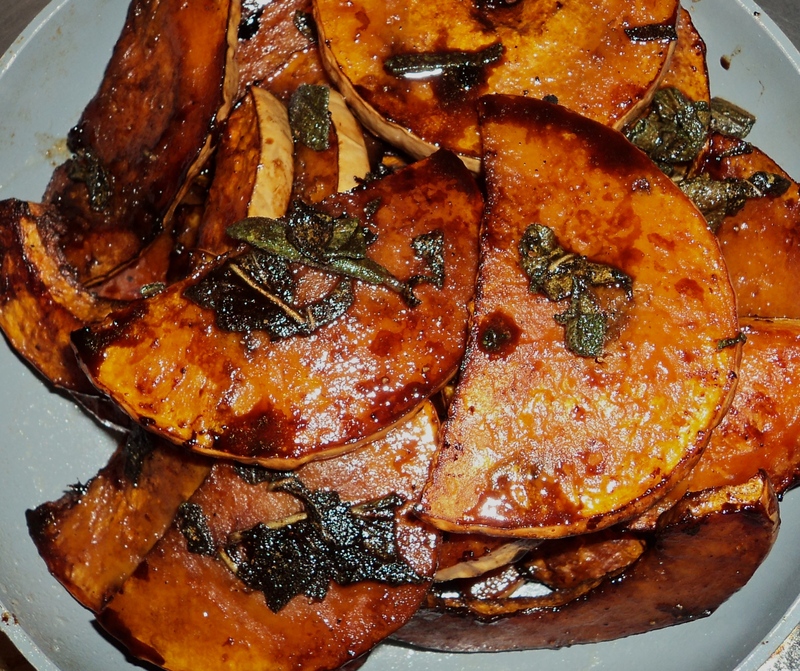 I also roasted butternut for a soup – but that one was so simple, a recipe is kind of silly. I basically peeled and seeded a butternut, chopped it up, added a few tablespoons of olive oil and some spice – paprika, ginger, cinnamon and nutmeg – salt and pepper, and roasted it in a hot oven (225 C / 450 F) until it was soft. I mashed it, put it in a pot, poured a cup of water over, and brought to the boil. Blended it to a puree, and added a touch of milk and adjusted spices. Pure butternut heaven! I roasted these tomatoes in a very hot oven for about 20 – 25 minutes – until they were very soft, slightly burnt and caramelised, but still holding their shape and size. I then flipped them over, turned the oven off, and went out – and when we got back home, the tomatoes were slightly dried – almost like semi-sun-dried tomatoes. They had intensified in colour and flavour, without losing their shape or size. Absolutely gorgeous. I recommend this if you can – roast for half an hour in the morning, and then just leave them there. When you get home, you will have an amazing tomato dinner waiting for you! These are soooo good in pasta, in a grilled cheese, in salad, soup, just about anywhere you need a pure shot of tomato flavour. You will definitely have extra left over. Seems a shame to roast these tomatoes for just the one tart! Anoint your extras with a bit of olive oil and save in the fridge. Preheat oven to 225C (450F). Prepare a baking sheet with parchment paper. Wash and dry the tomatoes. Slice them thickly (about 3 – 4 slices per fruit), destem if you feel the need, and arrange in a single layer on your baking sheet. Sprinkle olive oil judiciously over all. Sprinkle with salt, pepper, basil and sugar. Add sliced garlic (I usually stick one or two on top of each tomato slice). Bake for 20 – 25 minutes until the tomatoes are oozing juice, blistered a bit, but still holding their shape and size. Take the baking sheet out of the oven, switch off the oven, and flip the tomatoes over. Put back into oven and leave for at least 2 hours if not the whole day. Preheat oven to 180C (375F). Line a baking sheet or pan with parchment paper. Remove parchment paper from the baking pan, and place flat on table. 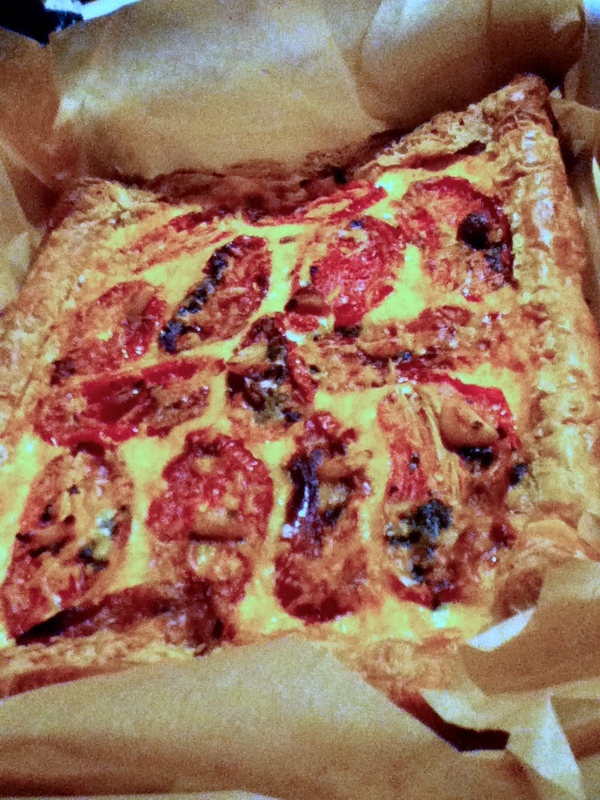 Place a sheet of puff pastry (or a square of your own made cheese pastry) onto the parchment. Roll out the pastry to to a rectangle about 18″ by 12″ and then fold over the edges by about 2 inches all around. Pinch to make sure the folded over edges stick, and using a fork, prick holes in the centre of the pastry. Slide onto your baking sheet or pan, and bake for about 25 minutes, or until the pastry has puffed up and is a light golden brown. 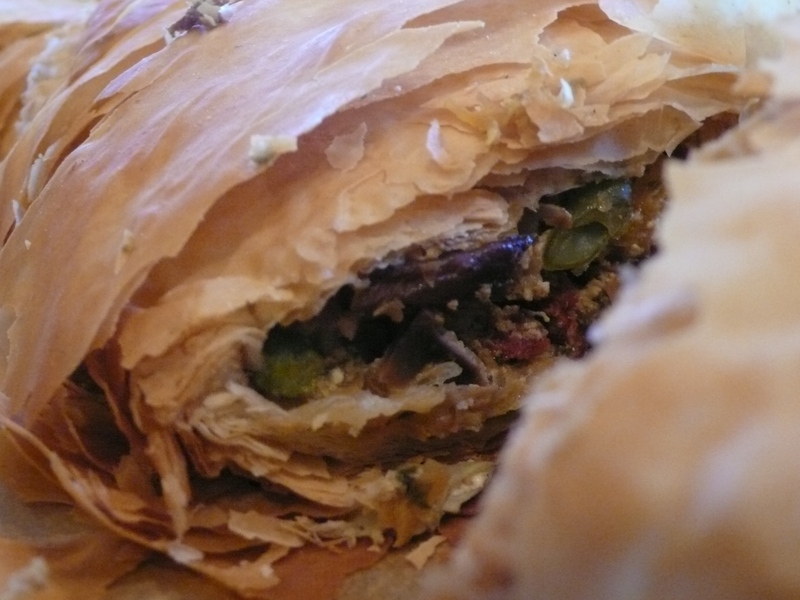 If you are using puff pastry, remove from the oven, and dig out about half of the centre layers. You will have very puffed edges, and a crisp centre. Beat together the sour cream, ricotta, cream cheese, garlic, egg, salt and pepper and 1/4 cup of grated cheese. Pour into the centre of the pastry. Arrange the roasted tomatoes on top of the mixture, and sprinkle with the remaining grated cheese, making sure you dont cover the tomatoes completely. Bake in the oven for a further 20 minutes or so, or until the centre is puffed and browned. Slice into pieces and enjoy! This can be served at room temperature, or even from the fridge the next day and is still very scrummy. After the party and the cakes and cupcakes and cookies … and the traumas of today (Z had her 1 year checkup and injections at the doctor) … it was time for something soothing. It has also been quite rainy these last few days, so I decided to make carrot soup. Well, that, and we had plenty of carrots left over from the party! The preponderant taste of this soup is carrot, but it has the addition of just a bit of butternut for silkiness, and some tomatoes for heartiness. I do love soups. When youre ill, and you just dont want to eat, soup can tempt you with its scent, its warmth, its comfort factor. When its rainy outside, soup makes everyone feel good. And on hot days, a cold soup is a refreshing option for a quick meal. Speaking of which, this carrot soup is just as good cold as it is hot – and its amazing orange glow immediately raises the spirits! I served the soup with toast, spread with the last of the artichoke spinach dip. It was such a great contrast – the sweetness of the carrots juxtaposed with the salty creaminess of the dip. Warm garlic bread would also be a nice option here … just think about how to make the sweetness pop by adding a salty element. In a large pot, heat the extra virgin olive oil over medium heat. I specify extra virgin here because it adds a depth of flavour to the soup. If you dont have it, use regular olive oil or vegetable oil. Saute the onion until it becomes glossy and soft. Add the garlic, and stir well. Season with paprika, oregano and salt and pepper. Stir to combine. Add the carrots, butternut and tomatoes in batches. Stir after each addition, and allow the vegetables to soften a bit. Add the water, and bring the mixture to the boil. Reduce the heat, and simmer for 20 minutes or so, or until all the vegetables have softened. You may find you need to add more water, but do this judiciously. You want quite a thick soup. 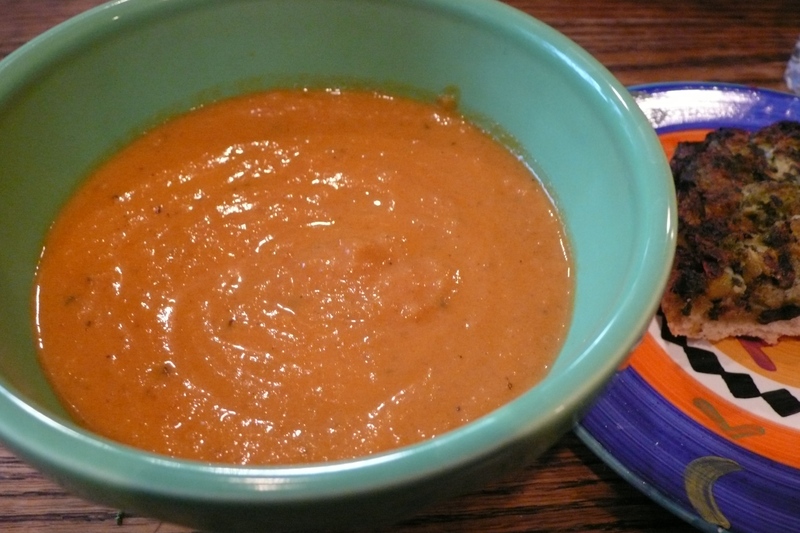 Once all the vegetables have softened, puree the soup using an immersion blender, or a stand blender or food processor. Be careful as the soup will be quite hot! Taste and adjust seasonings. I often find I need to add a touch more salt. Just before serving stir in the cream or milk. Do not bring to the boil, but heat until simmering. Serve with toast on the side for a comforting bright meal. Today we started getting in gear for Queen Z’s 1st Birthday Party. Did most of the shopping and I prepared the butter cookies for baking tomorrow morning. So tonight, we wanted a good and simple meal that would nourish us and keep us going! I decided to cook the butternut that has been sitting on the table looking at me friendly like for the last couple of days. My friend, Floating Lemons, posted a recipe on my Facebook page that inspired me. I decided to make roasted butternut and combine it with toasted spiced walnuts and some gorgeous blue goat’s cheese I found at the market. I wanted to serve it with spinach couscous, which I have made before. As the recipe was coming together, I decided that the butternut and couscous together would be a bit dry – so I made a red wine orange sauce on the fly! I combined the butternut with the walnuts and cheese, placed them on the green flecked couscous, and drizzled the wine sauce over. It was delicious! And a great example of how a recipe can expand as you make it. This may seem a little complex, but to be honest, I made the whole thing in one small saucepan (with a tight fitting lid! ), and a roasting dish. We all have too much on our plates for me to start cooking with a thousand pots, so the recipe will reflect the step by step process I went through. 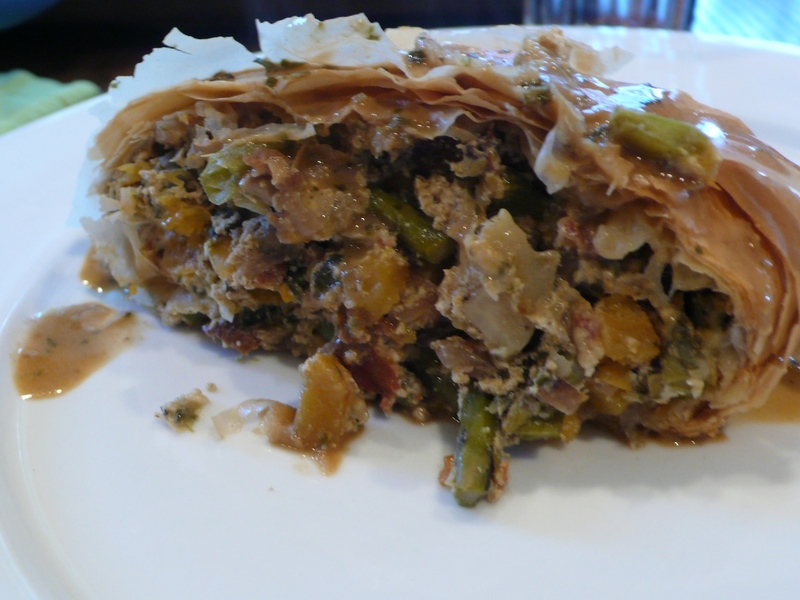 It feels and sounds quite complicated, but if you read the recipe a few times, you will see that its really easy peasy! I started the butternut roasting and then got on with the rest – toasted the walnuts, chopped the cheese (which you can omit easily if you are vegan), made the sauce and the couscous. By the time the butternut was ready, the other ingredients were just waiting to be combined! This meal will serve 4 hungry greedy people or 6 refined ones. You can easily cut it in half as well, or double it if needed. Enjoy! In a large bowl, using your hands, combine the butternut, garlic and olive oil. The oil should lightly coat the butternut, not overwhelm it. Salt and pepper lightly and mix again with your hands to combine. Line a jelly roll pan or cookie sheet with parchment paper. Arrange the butternut and garlic in a single layer on the pan, and roast for at least 30 minutes (it can go up to about 45) or until the butternut are soft, and slightly caramelised around the edges. Once the butternut has roasted to your preference, take out of the oven and set aside to cool a little. Chop the walnuts into small chunks, and put them into a non stick saucepan. Place saucepan over medium heat, and start to toast the walnuts. You need to watch quite carefully so they dont burn, and stir often with a wooden spoon. If you are worried, lower the heat a bit. The oils in the walnuts will release and you will smell the wonderful, unmatchable scent of toasted nuts. Gorgeous. Once the walnuts have just started to toast, sprinkle the paprika, red pepper and salt over the walnuts and stir to combine. Wait for the spicy scent to hit you and then drop a few drops of olive oil over all, and stir. The olive oil will help the spices adhere to the walnuts. Toast for about a minute or so more – and taste to see if its to your liking. If so, take off the heat, and set the walnuts aside. I put them in a teacup! 1/4 cup orange juice – fresh squeezed is best but if you only have orange juice from a carton thats fine too – it will be a bit sweet, and you might have to adjust accordingly. This is not tons of sauce, its just a lick to give moisture and flavour. Clean out the saucepan, and combine the red wine and orange juice together. Over high heat, bring the mixture to the boil, and boil quite rapidly until reduced by at least a third, and up to half. Whisk in the butter or margarine, and add salt to taste. 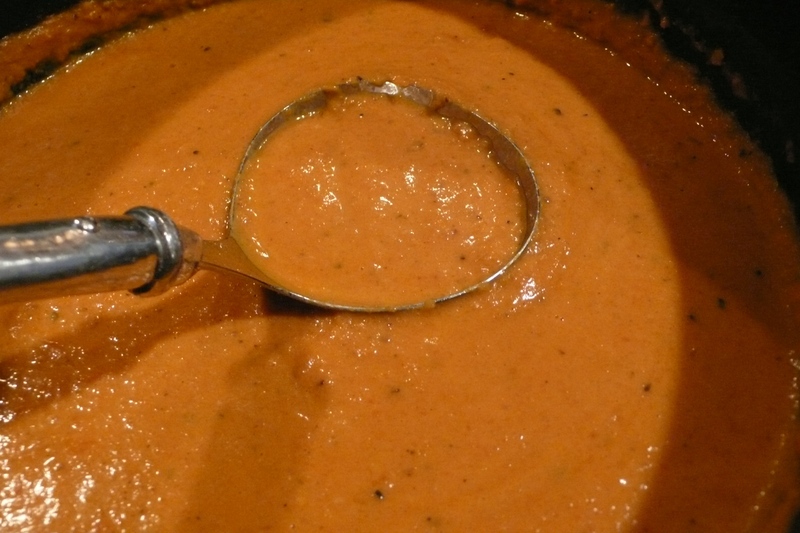 You should have quite a thick winey sauce – almost a glaze – with a strong orange flavour. Orange goes beautifully with butternut, so this will only brighten its amazing taste. Whisk in the sour cream, if using, until the sauce is smooth. Taste and adjust salt. You could add some pepper as well, though I chose not to. Pour into a teacup or mug (or small bowl, if youre fancy!) and set aside. Clean out your saucepan again, and heat water, butter or olive oil and salt until the water comes to a full boil. Stir in the couscous, and take the saucepan off the heat. Cover with lid, and allow to sit for five minutes. Mince the spinach very fine. Remove the lid from the saucepan, and using a fork, fluff the couscous. Add the spinach all at once and mix thoroughly to combine. Taste and adjust seasoning. The roasted butternut should have cooled a bit to room temperature. In the roasting tin, combine the butternut, walnuts and cheese (if youre using). Mix well. Drizzle about half of your red wine sauce over and toss gently to combine. Arrange the spinach couscous on a serving platter or in a large bowl. 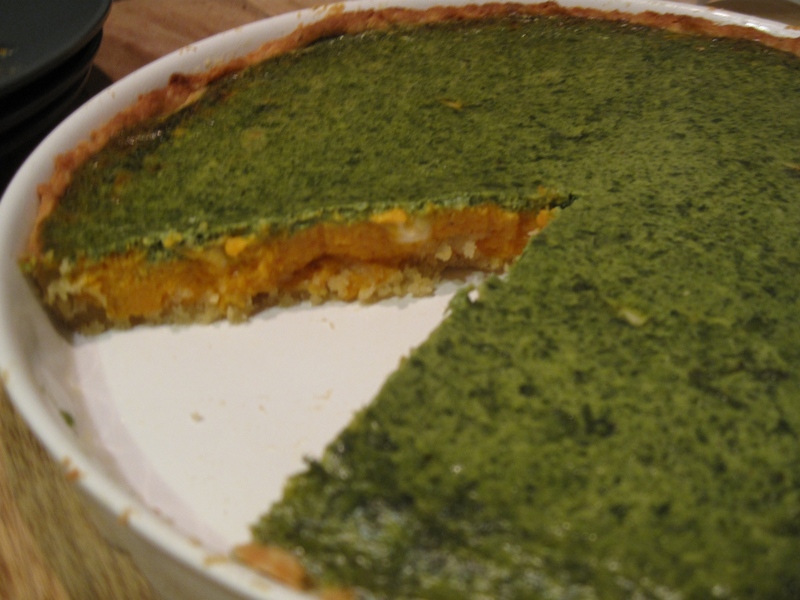 Make a well in the centre, and place the butternut mixture into the well. Drizzle the rest of the red wine sauce over, and serve. Enjoy with loved ones. PS – the leftovers are divine for lunch the next day, tossed together as a salad – or you could bring the whole thing on a picnic as a salad – its good cold too! I am exhausted tonight so this will be a short post! So it goes in a house with baby and multiple generations! I loved this salad. Perfect as a side dish – or if you want, add a few shavings of parmesan, or some salty feta, or a couple dollops of creamy sweet ricotta – or if you are vegan, a few chickpeas – for the protein, and you have lunch! Best served cold, the butternut is oven roasted ahead of time and refrigerated. So when it comes time to serving, its really a matter of putting it all together and devouring. I love the golden orange happiness of butternut, and I adore how easy it is to cook. Its forgiving, and its natural sweetness automatically caramelises in a hot oven, so you dont really need to add anything in the way of herbs or spices – the vegetable flavours itself beautifully. This is a meal I crave over and over again. 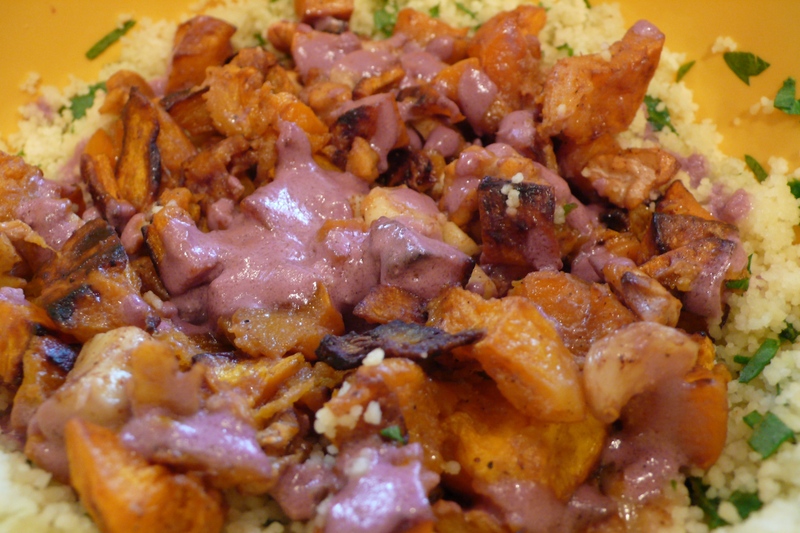 I love juxtaposition in my food – the spicy, slightly bitter bite of arugula, and the sweet creamy richness of the butternut are wonderful partners. They compliment and play off each other and make me very happy. 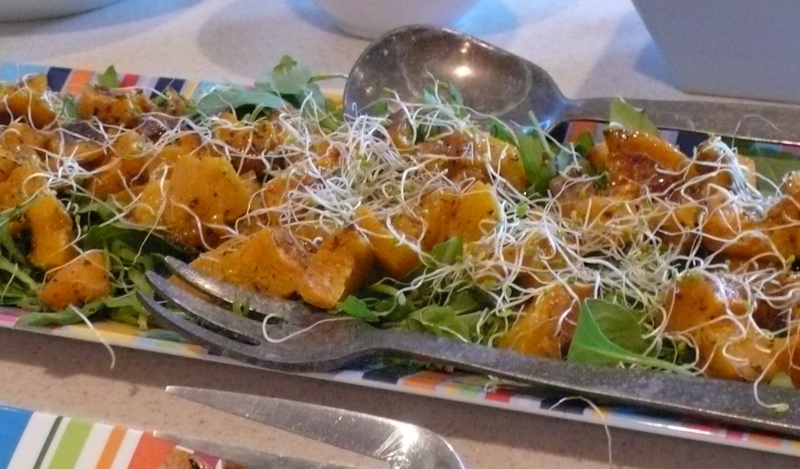 The night before (or morning before) you intend to serve the salad, prepare the butternut. Preheat your oven to 190 C.
Peel, seed and roughly chop 1 medium to large butternut. Put in a bowl, and pour over 2 tbsp olive oil. Using your hands, mix well, ensuring that all the butternut is coated. Arrange the butternut on a jelly roll pan or other large shallow baking pan, in a single layer. Salt and pepper well. Arrange the garlic cloves amongst the butternut. Roast for about 45 minutes, or until you see the butternut beginning to caramelise. I usually try and flip the butternut over half way through the cooking time as well, so that both sides get a bit of browning. Take out of the oven and let cool to room temperature. Return to bowl, and refrigerate for at least 4 hours or overnight. Just before serving, take the butternut out of the fridge. Fish the garlic cloves out of the butternut mixture. They should be very soft. Pop them into a small bowl or cup and mash the garlic with a fork. Whisk in the olive oil and balsamic vinegar. Find a lovely large flat serving platter or plate. Strew the baby arugula over the plate in one beautiful bright green layer. Tumble the butternut over, and pour about half the dressing over. Reserve the rest to serve on the side if you wish. Sprinkle one or two toppings of your choice over all, and serve. Perfect for a hot summer’s day! Wow, today was such a lovely day! Lunch at Le Pain Quotidien – perfect tart lemonade with loads of mint, and a gorgeous open face sandwich of fresh ricotta, mission figs, cracked black pepper, honey and chopped tomatoes. I know, it doesnt sound like it would all go, but oh boy, did it! Superb. And then home, and loads and loads of cooking. Dinner was a cold potato salad – roasted garlic and baby tomatoes, mixed as soon as they came out the oven with a few tablespoons of mayo. SO good. 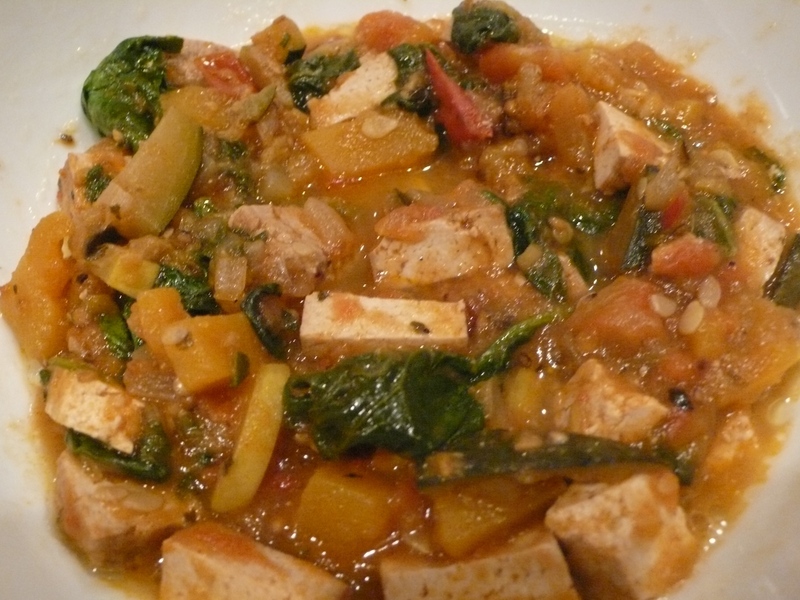 And summer stew – the best, brightest and tastiest of the summer veg, stewed briefly together, served with some rice. Vegan, and delicious. And for dessert, a strawberry fool – those gorgeous strawberries I bought yesterday, macerated with a bit of balsamico, and then folded into lightly whipped cream which had been sweetened just a bit, and flavoured with a bit of vanilla. Actually, it turned out to be an Eton Mess, because we also had some store bought meringue which we crumbled over the top. So bloody good! And then of course, I had to do some prep cooking for M’s birthday tomorrow. I have decided that since it is summertime, I am not going to bother with huge numbers of hot dishes. Most everything can be served cold or at room temperature. Tonight I made broccolini with toasted almonds and a bright lemon olive oil dressing. Roasted butternut which will go into an arugula salad with a few shavings of parmesan. The stuffing for the mushroom pastry. The pudding for the chocolate cake. My feet hurt! And its late. But at least tomorrow, I can bake the cake in the morning, and do the mushroom pastry in the afternoon, and assemble all the salads in between, without having to worry I dont have enough time. Plus, we are planning on going to the farmer’s market! I cant wait! That should be wonderful fun. So now, back to this summer stew. These are a few of the beautiful vegetables I found at Whole Foods. I didnt want to over cook them, as their bright clean flavours were just too delicate. Also, to be honest, I only put a tiny bit of flavouring into this stew – I wanted the veggies to perfume the gravy with their own fragrance, and I felt it really didnt need any additional enhancement. Please go to the market and see what is bright and fresh and tasty. Use that. If you dont see a squash, but there is a wonderful array of carrots, substitute! This stew is about using whats best in the summertime, and celebrating it. Enjoy! In a large pan, over high heat, in about 2 tbsp olive oil, saute the onion until glossy and softened. Add the aubergine, and sautee until the aubergine starts to brown and burn a bit. Season with paprika, oregano, salt and pepper. Add the yellow zucchini squash and zucchini to the pan, and sautee until slightly softened. You may need to add more olive oil. Add the butternut, and combine well. You may want to put a lid on the pan to soften the butternut a bit, but I usually just let all the ingredients bubble and saute for a few minutes. Add the tomatoes, and encourage the sauce that will start to form with the addition of some hot water. I usually add about 1/2 cup, and let the stew cook for about 5 minutes, and then check the butternut. If it needs more time, I add more water. Let cook and meld together for about 10 – 15 minutes, and taste and adjust seasonings. Dont overcook. 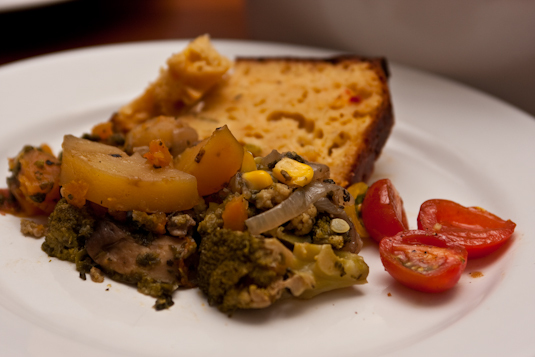 This is a delicate stew, and you want to really allow the clean fresh flavours of the vegetables to remain intact. Add the tofu and baby spinach, and cook just until the spinach is wilted. Serve warm over jasmine rice. I was expecting quite a few people tonight to watch the Brasil – Netherlands game (was that a surprise or what?!) and so decided to make a lasagne. But I didnt want to do one which was rich in tomato sauce (though I do have a wonderful sauce that has a secret ingredient… oh wait, I will leave that for another time!). 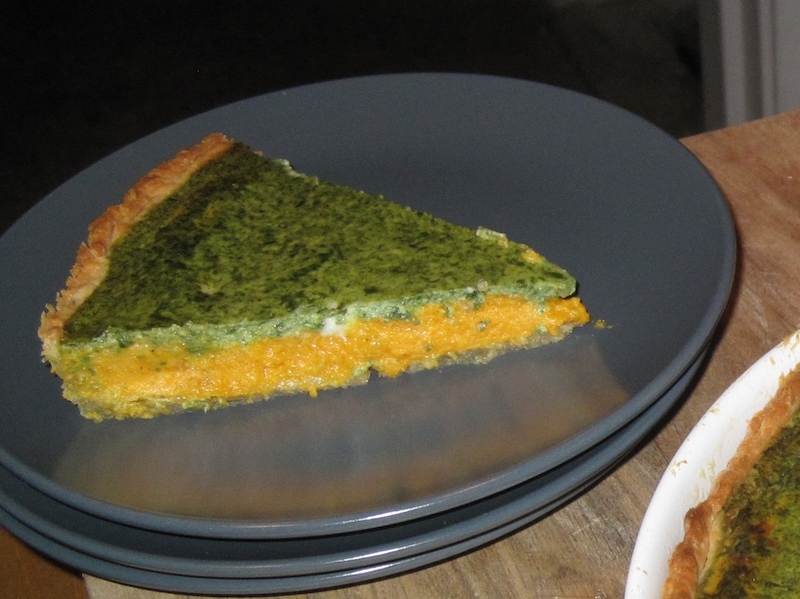 I decided I wanted to do a lighter version of lasagne, so I thought of butternut (orange for the Dutch) and pesto (green for the Brasilians). Instead of a bechamel or thick cheese sauce, I decided to do a mix of ricotta, light cottage cheese and sour cream. Not traditional, I know, but it made the lasagne very edible especially when watching such a nailbiting game! It wasnt heavy or overwhelming, but really scrumptious and pleasurable. This is really easy to make, especially if you do the pesto the day before. This is recommended anyway to ensure that the sauce deepens in flavour and complexity. The rest is a matter of mixing a few things together, and roasting the butternut, and it really can do that all by itself! Preheat oven to 180C. Peel, deseed and chop your butternuts roughly. Tumble the butternuts onto a cookie sheet in one layer. Sprinkle with a few tablespoons extra virgin olive oil, some seasoned salt if you have it (if not regular salt is fine), and white pepper. Using your hands, mix all well, and pop into the oven. This will roast very quickly – you probably dont need more than 20 – 30 minutes. You will know its done when the butternut starts to caramelise and brown on the edges, and its soft through. Gorgeous. Leave to cool while assembling the rest. This is not your traditional bechamel. 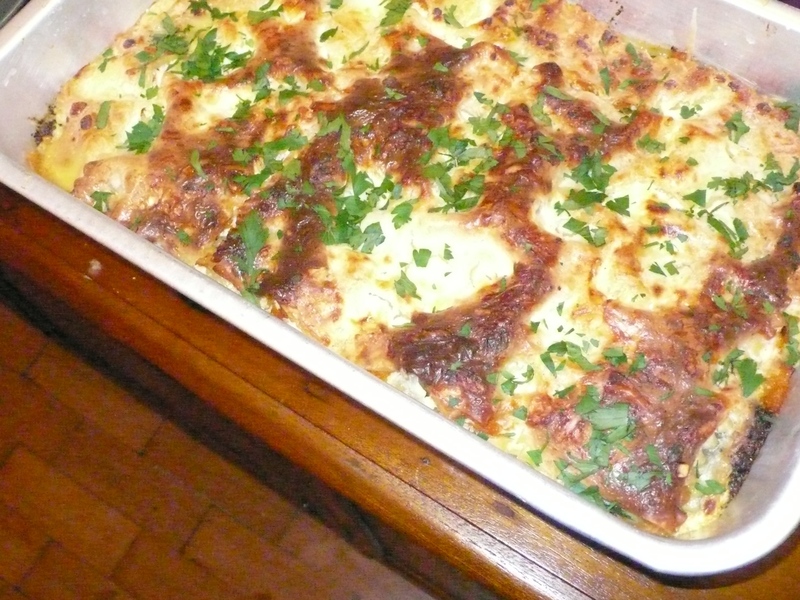 Its much lighter, and yet ensures that the lasagne stays moist and tastes very rich. Its easy to make because it takes no cooking. Just a little beating together and you have alchemy. The egg just adds lightness and helps everything cook. If you dont have one, or dont want to add one, then forego it. In a large bowl, combine all ingredients, and set aside until assembly. May I just make one note here? I had a beautiful bowl of cottage cheese, ricotta and parmesan and I broke the egg straight into it. And the egg was bad. The smell was terrible, and I was heartbroken. All that good food gone to waste, simply because of my laziness. Please do remember to make sure that when you are adding egg to a recipe, always break it open in a separate container and then add it to your main ingredients. You will save yourself an extra expense and trip to the grocery store. I know, from experience! 500 g box of dry lasagne pasta or fresh, if you can get it! If you are using dry pasta, fill a pan with hot water, add a few drops of olive oil, and put the pasta in. This will hydrate it a little, which will help in the baking process. 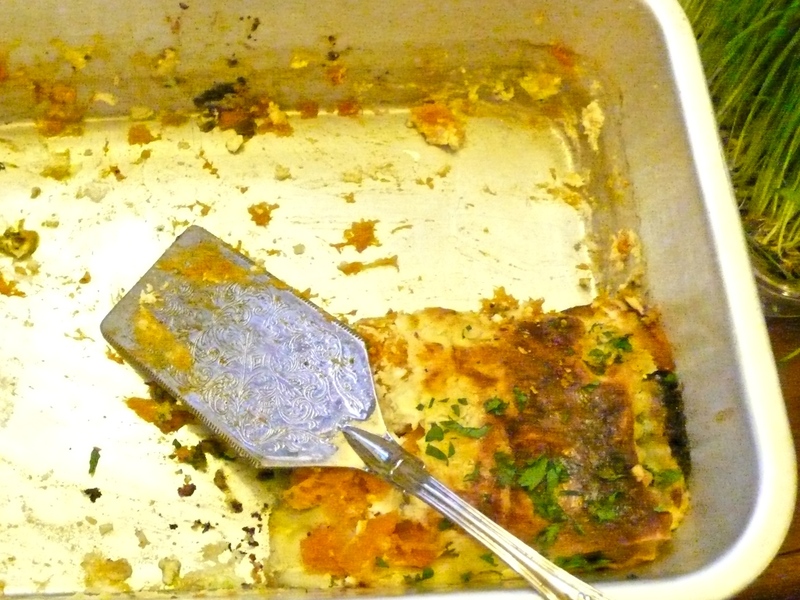 You dont cook this lasagne for long, and it does not have a thick saucey component that will cook the pasta during baking. Hot tap water is fine, or a kettle that has been boiled and left for 15 minutes or so. You should be able to touch the water. Leave the pasta in for about ten minutes. Oil the bottom of a very large roasting tin with a little olive oil. Spread about 1/3rd of the butternut over the bottom of the pan, sprinkle a little bit of parmesan over, and drop about 1/2 cup of white sauce over this. Cover entirely with pasta. Spoon about a cup of white sauce over this (or more – you want to cover the pasta entirely but not thickly), and spoon tablespoons of pesto on top. You want a white base, with beautiful bright green blobs. Cover entirely with pasta. As you cover it, you will see the pesto spread – this is good. Do another butternut layer, another pesto, and a final butternut layer. Cover with a final layer of pasta, and pour the rest of the white sauce over all, and sprinkle the remainder of your cheese over. You should have a pretty full pan, and five layers of lasagne. Bake in hot oven for about half an hour, or until heated throughout, the pasta is soft, and the top is brown and crispy. Let rest for a few minutes when you take it out of the oven, and chop up a handful of Italian parsley to sprinkle over.